Solvay pursues comprehensive initiatives and processes to cultivate the engagement and well-being of its employees, including personal development, rewards and recognition, an inclusive culture, and work-life balance. The Group also considers that engagement is fostered by freedom of association and collective bargaining. Solvay defines employee engagement as the commitment to be highly involved in their work. The Group believes that engagement increases performance through higher productivity and employee retention. Five aspects have an impact on employee engagement: pride, quality of work environment, overall satisfaction, motivation, and attachment to the company. Solvay also considers that engagement is fostered by fair labor practices and well-being at work. 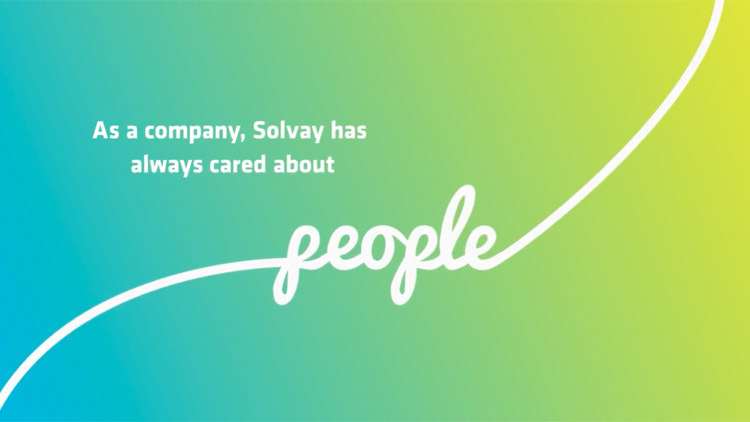 Employee engagement is an increasingly important concern for Solvay. It is measured through a worldwide annual survey. The objective of this survey is to measure the engagement of Solvay’s employees and the factors leading to engagement, in order to identify strengths and areas where the working environment and employee experience can be improved. The Group 2025 target is an engagement index of 80%. This index is used as a yardstick to decide which actions are needed in areas such as personal development, rewards and recognition, an inclusive culture, and work-life balance. In 2017, Solvay assessed its workforce engagement via the "Pulse Survey", a shortened annual version of the global "Solvay employee survey" census. Unlike the previous year, the roll-out was done entirely digitally, including the online survey and online manager and site reports. Each manager leading a team with more than five employee responses received a feedback report that can then be used to develop a local action plan. *due to the Solvay Care agreement which covers all the employees. Solvay considers that maintaining trusting and constructive relations with employees and their representatives forms the basis for fair labor practices. This relationship is built on the Group’s commitment to respecting employees’ fundamental human rights and to guaranteeing their social rights. Labor relations are managed at four levels: site, country, Europe, and Group. In 2015 Solvay created a global employee representative body, the Solvay Global Forum, composed of eight employee representatives from the seven main countries where Solvay operates. This Global Forum meets with the executive committee once a year, in Brussels, during a one-week session. Video conferences are held quarterly, bringing together the Solvay Global Forum and the top management of the Group to comment on and discuss the quarterly results of the Group, and to keep informed of the main new projects. After two years of experimentation, the Solvay Global Forum has been established as a permanent body of the Company through an agreement signed by the CEO and the head of employee representatives in June 2017 in Houston. Solvay and its European Works Council (EWC) have been in permanent dialog for more than 20 years. In 2017, the EWC met on two occasions in a plenary session. The sustainable development EWC commission met on two occasions and the EWC Secretariat met eleven times with senior Group management, allowing these representative bodies to be part of the evolution of the Group. Subject matters receiving particular attention were mergers and acquisitions, restructuring issues, evolution of employment and working conditions in the Group, and strategy and sustainable development issues. The main topics discussed with the Sustainable Development Commission of the European Works Council in 2017 include the five priority targets of the Group, the health and safety plan, the Human rights due diligence process in the Group, the new well-being at work policy, and the results of the Group’s sustainability performance assessment by extra-financial rating agencies. On December 17, 2013, Solvay signed a Corporate Social and Environmental Agreement for the whole Group with IndustriALL Global Union. This agreement is based on International Labor Organization (ILO) standards and the principles of the United Nations Global Compact (UNGC). It is a tangible expression of Solvay’s determination to ensure that basic labor rights and the Group’s social standards in the areas of health, safety, and environmental protection are respected on all of its sites. In February 2017, Solvay took that collaboration one step further by renewing its Global Framework Agreement (GFA) with IndustriALL, reinforcing its commitment by adding new social projects, such as societal actions and the protection of mental safety at work. To ensure all employees comply with the IndustriALL Global Union Agreement, it has been integrated as an employee practice in the Solvay Way reference framework. Some of the collective bargaining agreements specify notice periods for consultation and negotiation. The Global framework agreement concluded between Solvay and IndustriALL Global Union includes a provision for employees and unions (where they exist) to be informed in advance of any restructuring plans. In some of the collective bargaining agreements, a notice period and provisions for consultation and negotiation may be specified. Named “Solvay Cares”, this initiative perpetuates the pioneering social vision of Ernest Solvay, who introduced forms of social security at the group he founded more than 150 years ago. Life insurance with coverage for the family or partner. Well-being at work is a holistic concept which relates to all aspects of the quality of working life that ensure workers are safe, physically and mentally healthy, satisfied, engaged and efficient. It contributes to a culture of recognition and support, to work-life balance, to employees’ growth and development, and to good communication and collaboration. The well-being indicator for Solvay’s workforce is measured via the yearly “Solvay Engagement Survey”. Four questions selected from the survey of employees relate to perceived well-being. Responsibility for the well-being program is assigned to the Head of Group Industrial Relations and Social Innovation, with the support of a multidisciplinary Corporate Committee on Well-being at Work. This Committee was set up in October 2016 and meets monthly. It includes occupational physicians and psychologists, Human Resources, and Health and Sustainable development experts. An important step in the current well-being program is to develop competences on stress prevention and to implement positive behaviors within the Group. The Committee is currently developing specific training material for managers and for local teams that support well-being (Human Resources, Occupational Health, physicians, and Health, Safety, and Environment staff), and it is also creating materials to raise awareness among all employees. Training of managers started with the Executive Committee and the leadership council in September 2017. The network of occupational physicians and psychologists will increasingly examine the root causes of professional burnout and report cases to the Comex twice a year. A Group Guideline on the Prevention and Management of Stress at Work offers entities guidance. In 2016, Solvay issued guiding principles on employees’ work-life balance and on practical steps to ensure this balance. Those principles have been given a high profile throughout the Group, targeting everyone on the shop floor. A full section of the Solvay Way framework, which Solvay entities use to perform annual self-assessments and define improvement plans, is now dedicated to well-being. It encourages sites to develop local well-being programs and assess stress risks. Well-being is part of the management aspects examined during the annual visits organized with IndustriAll. Site management teams are informed of the local results of the Group perception survey and are invited to design action plans to foster improvement where needed, especially for sites with below-average performance. The focus is on organizational factors such as the quality of managerial support and the degree of employee autonomy in their job. employee access to an individual emergency response by phone (e.g. Employee Assistance Program). training for the medical network on the identification of (pre)burnout cases. A participatory dynamic got under way at the Solvay Campus headquarters in Brussels in 2017, with the definition of an action plan addressing seven themes selected with workers for concrete improvement. The actions are linked to risk factors identified previously thanks to a 2016 survey. In practice, tips related to well-being at work are communicated regularly and widely: for example, to prevent a sedentary lifestyle, headphones are provided for telephone calls. To alleviate potential workload and time pressure issues, the Solvay Campus has held a number of well-attended workshops on how to reconcile work efficiency and well-being.